AskingCanadians™, a Delvinia company, today announced the launch of a social media recruitment campaign offering Canadians the opportunity to voice their opinions by joining its online research community—and the chance to win up to $10,000 in prizes. Using Facebook and Twitter, AskingCanadians™ is reaching out to Canadians from coast to coast, inviting them to join Canada’s fastest-growing online research community. As an incentive, new members—and existing panellists that refer individuals who join—will have the chance to win up to $10,000 in prizes, including an iPad, cash gift cards and a travel voucher. Prize draws will be held at four stages throughout the end-0f-summer campaign. The earlier participants join, the more prizes they can win. And, participants that refer friends who become panel members will receive additional contest entries for every referral that joins. AskingCanadians™ was established in 2005 as an online data collection firm with a research community of Canadians who share their opinions by participating in interactive online surveys. Members earn rewards for every survey they complete and can choose to collect either Hbc Rewards of Aeroplan Miles. For more information about the AskingCanadians™ recruitment campaign, please visit facebook.com/askingcanadians. 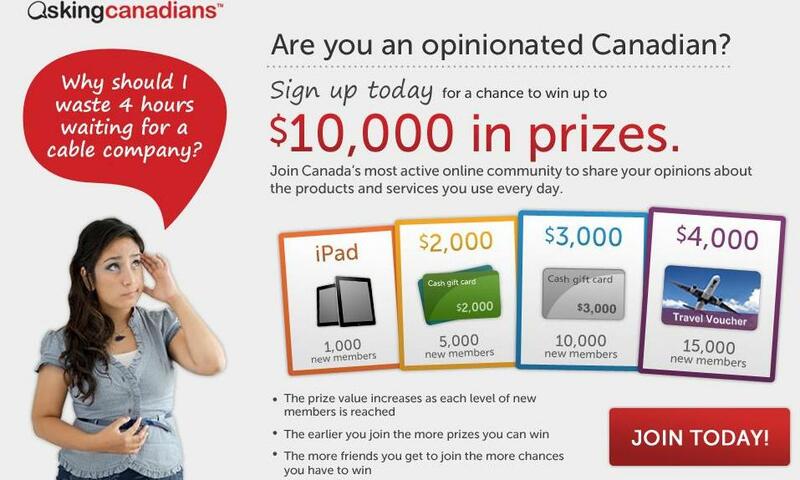 To join AskingCanadians™, visit http://contest.askingcanadians.com.